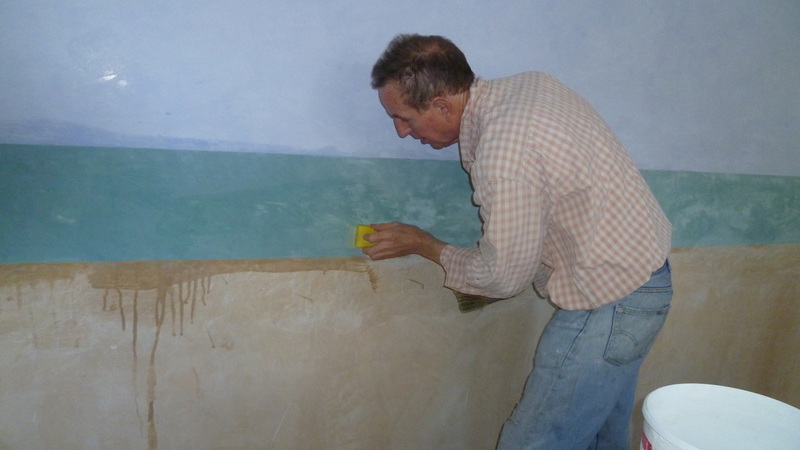 This image shows me working on a fresco of a seascape, directly onto a wall in a kitchen. I am an artist plasterer living in York. My work involves making plaster pieces, which can be hung like a conventional piece of art. I also work directly onto walls, using the traditional fresco technique and my own processes which I have developed over the years. I am a time-served plasterer, who had the good fortune to carry out my apprenticeship under some of the finest builders in Liverpool , who had themselves trained at a time when Liverpool was thriving, and new impressive and important public buildings were - and still are - part of the landscape. They taught me the importance of preparation, attention to detail. It was a year before they felt I was ready to stop mixing the plaster in buckets, and start spreading it onto the walls. In the 1980's I had the opportunity to study Fine Art at Leeds Metropolitain University where I graduated with a BA, and an MA from Canterbury School of Art and Design. I used this time to explore and develop new ways of working with plaster and researched the fresco techniques of the old Italian masters. I also was able to experiment with backing materials, again looking back to the traditions of wattle and daub as well as experimenting with different materials such as glass and slate.